Home / Biased Media / Duterte Critics / Gladys Chuchay Reyes / Gladys Reyes / Mainstream Media / Pres. Rody Duterte / Viral Stories / Gladys Guevarra Burns Duterte Critics: "Enough is Enough, Leave the President Alone & Let Him Do His Job!" Gladys Guevarra Burns Duterte Critics: "Enough is Enough, Leave the President Alone & Let Him Do His Job!" Veteran singer-actress Gladys Guevarra burned down all the critics of Pres. Rody Duterte on social media as she expressed her support to Pres. Rody Duterte, whom according to her was only mocked by some people because of his imperfections. 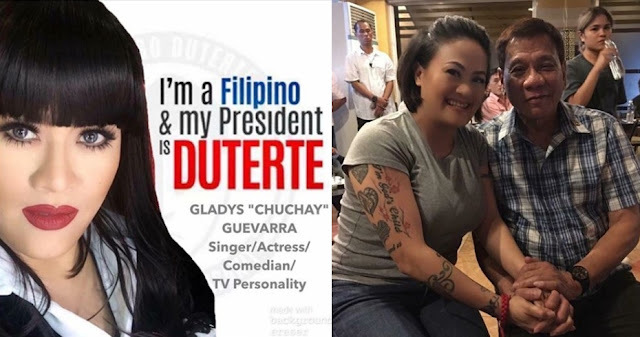 According to Gladys Guevarra who is also known as "Chuchay" on National TV, she posted her opinion about politics and admitted that she's ready on whatever backlash she may receive but she is sure that she is willing to defend herself against the Duterte critics. The former Eat Bulaga host stated that she felt ashamed of some people in the Philippines who didn't know how to respect the duly-elected President who was voted by more than 16 million Filipinos. Gladys Gueverra also criticized several news networks and the mainstream media as well as those reporters for reporting 'lies' against the President for the sake of writing a sellable story. The veteran actress also noted that it's her first time to see a President being examined word-by-word by the media and his critics as she urged the media people and all the critics to leave the President alone and let him concentrate on his job first as the criticisms against the Chief Executive will never help the country. I offer no apology for what I am posting, for this is truly how I feel. This is my opinion, not a debate. If you disagree or find my opinions offensive, I'm perfectly fine with that & no, I'm not offended, feel free to unfriend me immediately. I have lived through several Philippine Presidents prior to our current President Duterte. In my lifetime, I have never seen nor heard of a President examined over every word he speaks, humiliated by the public to the point of disgrace, slandered, ridiculed, insulted, lied to & beyond common logic, threatened with death. I am truly ashamed of the people of MY country. I am ashamed of the ruthless, hating, cruel, Duterte haters who display themselves as to having no pride, morals, ethics nor values in Our Country's traditions. Our Elders taught us 30, 40+ yrs ago to respect our President, whether we voted for them or not, & all these news stations & reporters who feel they have the right to carry on with obvious lies & say the things they do for a good story. Every other President before he was elected, that took the oath of office, was left alone, wasn't on the news 24/7, examined by their every word. ALWAYS BEING PRESSURED to do this or that & never given the time to take care of the important work this country really needs. I know he is not perfect, very different than what we've become in general to but ENOUGH is ENOUGH, LEAVE THE MAN ALONE & LET HIM DO HIS JOB!! None of the other Presidents in their times were spotless or perfect either. I want our President Rodrigo Duterte to succeed & try to make our Philippines great again! COPY AND PASTE IF YOU AGREE OR IF YOU'RE SICK OF IT TOO. Yes, I am a Duterte supporter. I always have been!